Rubber Mulch is created from recycled scrap rubber, usually from old tires. It is ground up into tiny pieces to easily fill spaces around plants and landscaping. Rubber mulch is a great way to recycle and stay environmentally conscious. 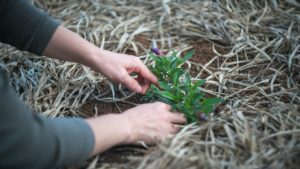 Using this alternative to wood mulch has become a popular trend for people wanting to decrease their carbon footprint. Old tires and rubber materials would most likely be thrown in a landfill, so it is a suitable option for those who want to recycle and reuse. 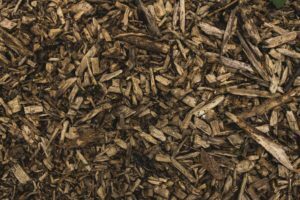 Why is Rubber Mulch Beneficial? Rubber mulch can be used anywhere you would put regular wood mulch. It is a great alternative if you are wanting to be more sustainable. There are also a lot of benefits of using rubber mulch that could lead to a more flourishing garden. 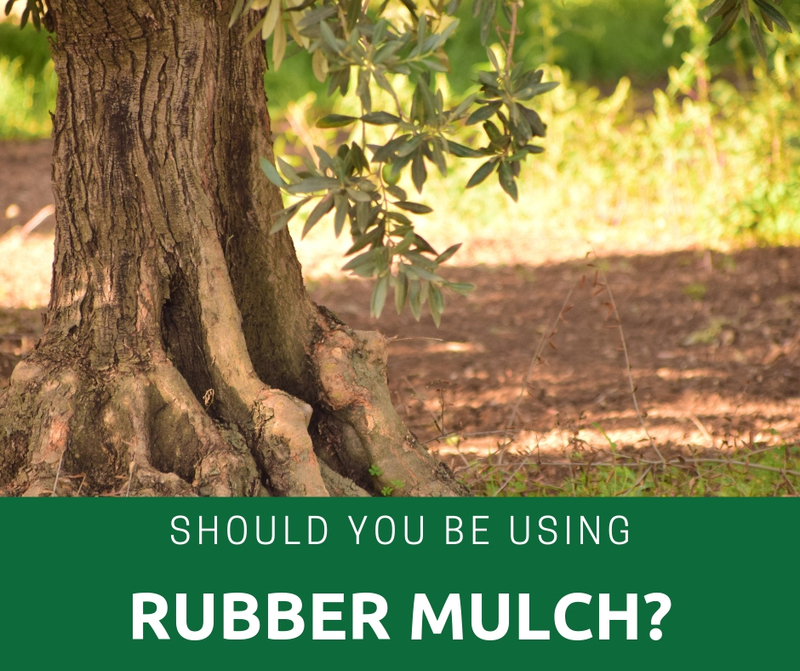 Since rubber is not absorbent, it allows for the soil to collect more of the water instead of the wood mulch soaking in the water before it can reach the plant roots. This leads to your plants having a more accessible water source, which enhances growth and liveliness. It also has the same effect with fertilizer, allowing for it to sink into the soil more easily. Rubber mulch impacts the growth of invasive plants such as weeds and fungus. The rubber acts as a weed barrier to invasive plant seeds and stops them from reaching the soil. This can save you a lot of time by not having to pull weeds and use sprays to keep unwanted plants from growing. Rubber mulch also requires very little maintenance. 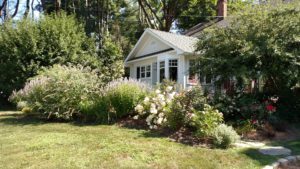 Along with having fewer weeds to worry about, it can also stand storms much better than wood mulch. It lasts much longer than wood mulch and does not need to be replaced as often. Since it’s made of wood it also does not attract termites or certain bugs, which is a common issue for other organic mulches. Preventing bugs like these can aid in protecting your flowers and plants from being poisoned or eaten. 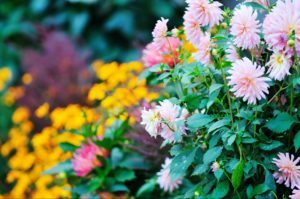 What are the Disadvantages of Rubber Mulch? The long-run is cost-effective since you do not need to replace it as often, but it is initially more expensive. This could take up to eight years to feel the return of money. This makes it a little trickier when clearing the rubber out of your yard. It takes more effort to get rid of rubber mulch, especially since it lasts for so long. Over time, the rubber could leak chemicals that can harm the surrounding plants. Zinc is one of the most prominent chemicals from rubber which could negatively affect plant growth and keeping them healthy. How Long does Rubber Mulch Last? Rubber mulch gained attention because of its durability and long lasting effects. It is said to last more than 10 years before it needs to be replaced or added to. Many people add wood mulch annually or every other year, depending on how the previous mulch placement is lasting. Wood mulch easily decomposes, wears down, and washes and blows away with storms. Rubber mulch reduces your need to repurchase so frequently and also gives you the additional added benefits that we’ve listed above as well. Where can you Buy Rubber Mulch? Rubber mulch is fairly easy to find in-store or online. Places like Walmart, Lowe’s, Ace Hardware, and other stores of that sort, usually have rubber mulch in stock. If not, they will ship your product to the store for easy pickup. There are also a wide variety of strictly online companies that sell rubber mulch that can ship to your door. The range of prices is very large, so it is important to carefully pick which brand is right for you. How Can Voss Land & Tree help? Voss Land & Tree has skilled experts who are ready to help with all of your mulching questions. They are here to provide information to make sure you choose the best option for your home. Check out our wide variety of landscaping services to make your life easier and happier! Contact Us today with any of your landscaping needs!